Here is an article about the show in the Saugus Advertiser by Neil Zolot. Click here for a promotional video about the show. Click here for an album of photos taken during performance. Click here for an article about our production in the Lynn Item. For a video sample of rehearsals, click here. 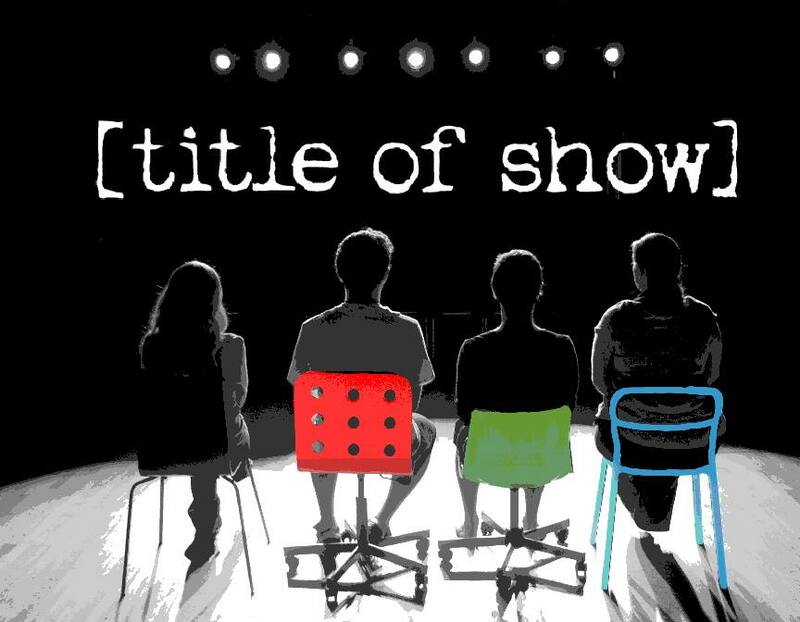 Our winter 2014 show was called [title of show]. This is a very clever and amusing musical about how it was written. Some people are writing a new Broadway musical about the process of writing a show. Their show is successful, and so they write some more songs about that. There are many references to other shows. The only thing they never quite come up with is a title, thus the [title]. We were thrilled to present our talented cast. Jeff was played by Stephen D’Amico. Hunter was played by Bobby Imperato. Andrea Lyons played Heidi. Rebecca Schneebaum played Susan. Bobby Imperato had been in many TCS shows. We welcome the other cast members to our company. And offer many thanks to everyone who auditioned. The musical director, who also performed, was Suzanne Jalbert. She was also the musical director for our 2013 productions of A Year With Frog and Toad, and A Look at the Past, A Light to the Future. The director was Nicholas Meunier. He won the DASH Award for Best Director of a Musical for the 2013-14 season, for his direction of [title of show]. He directed our 2012 production of Romeo & Juliet, and will also direct Macbeth in 2014. [title of show] was also nominated for several other DASH awards, including Best Musical. The cast performed a selection from the show at the 2014 DASH Gala. The stage manager was Lexi Deschene. She directed our 2013 production of The Glass Menagerie. The performance dates of [title of show] were February 28, March 1-2, and March 7-8-9, 2014. Fridays and Saturdays at 8:00 PM, with Sunday mainees at 2:00 PM. Tickets were $15 for adults, or $12 for seniors, students, and children. To purchase or reserve tickets, see our Tickets page. Jeff and Hunter, two struggling writers, hear about a new musical theatre festival. The deadline for submissions, however, is a mere three weeks away. With nothing to lose, the pair decides to try to create something new with the help of their friends Susan and Heidi, with Mary at the piano. With the cast in place, Jeff and Hunter begin a conversation about what to write about. Eventually, Jeff suggests they write about what to write about. They make a pact to keep writing up until the festival deadline, and to dream about the show changing their lives. [title of show] — taken from the space on the festival application form that asks for the [title of show] — follows Hunter and Jeff and their friends on their journey through the gauntlet of creative self-expression. We see them write and perform their show at the festival, and learn lessons about themselves as people, friends, and artists. [title of show] is above all a love letter to the musical theatre — a uniquely American art form — and to the joy of collaboration. The musical received a Tony Award nomination for Best Book of a Musical in 2009. [title of show] has music and lyrics by Jeff Bowen, and book by Hunter Bell. It was originally produced on Broadway by Kevin McCollum, Jeffrey Seller, Roy Miller, Laura Camien, Kris Stewart, Vineyard Theatre, and LAMS Productions, at the Lyceum Theatre, where it opened on July 17, 2008. Originally produced by the Vineyard Theatre, New York City, in February 2006. [title of show] was originally presented by Bridge Club Productions at the 2004 New York Musical Theatre Festival. A promotional video about our production on our Facebook page.